Alice Springs Australia is a great desert town right in the middle of Australia. 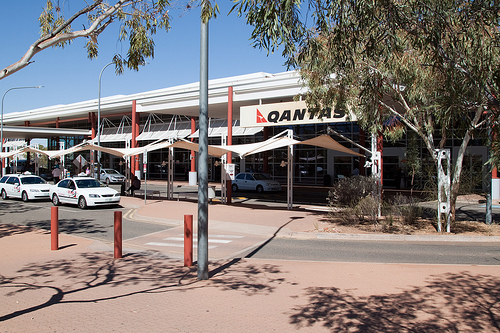 It used to be a telegraph station like Barrow Creek, Tennant Creek and other small places along Stuart Highway, but somehow it took off and today it is a thriving city with 25,000 people. The old telegraph station is still here, and other places to visit are the Cultural Precinct and Museum of Central Australia; Boomerang Art Gallery, the Billy Goat Hill lookout point, and the famous, and excellent, Alice Springs Reptile Centre. 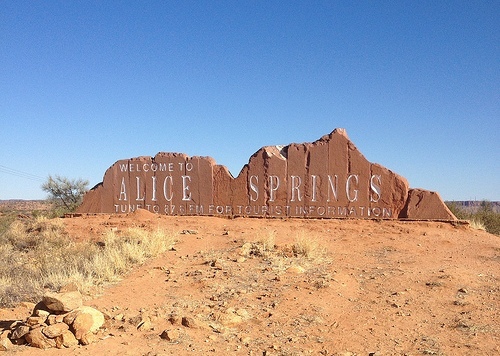 Alice is a great place to use as a base while discovering the Red Centre. Alice. Poster by AllPosters. Click on thumbnail to buy. As with many Australian cities, there is a pedestrian shopping mall in the middle of the city, called the Todd Mall. 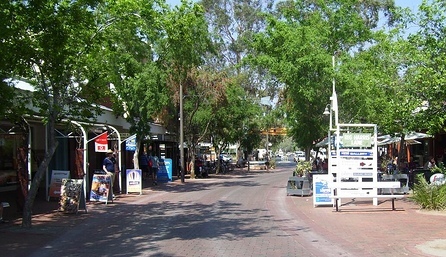 It’s a nice central shopping mall with restaurants, markets and shops in Alice Plaza; the John Flynn Memorial Church and the historical Adelaide House, one of the town's heritage buildings which was built in the 1920s and is now the museum of John Flynn who founded the Royal Flying Doctors Service. North of the Todd Mall is the National Pioneer Women’s Hall of Fame where you can learn everything about the early women in Australia. If you like Halls of Fame (the most famous one is the Australian Stockman’s Hall of Fame in Longreach), there is another one: National Road Transport Hall of Fame 14km south of Alice. 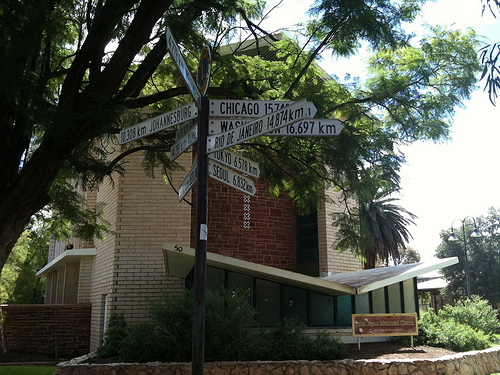 West of the town centre there is an area called Alice Springs Cultural Precinct which includes many historical and cultural attractions. The Museum of Central Australia has exhibits of Aboriginal culture, meteorites and natural history including Australia’s extinct megafauna fossils. The Alice Springs Cultural Precinct also includes the Araluen Arts Centre with the famous Albert Namatjira Gallery which has paintings from West MacDonnell Ranges and other spectacular desert areas around Alice Springs. Alice is in the middle of the colourful outback country with red soils and sunsets which inspire artists and there are many other art galleries in the town such as Desart, Mbantua Gallery, Gallery Gondwana and Boomerang Art Gallery and Artist Studio. 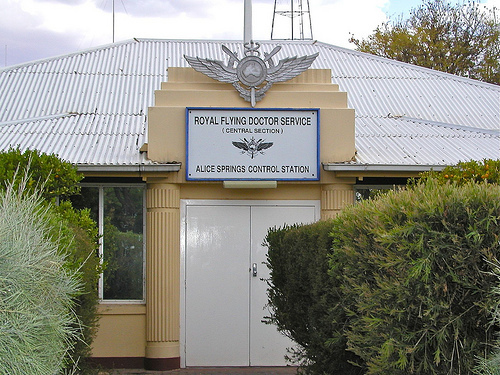 Other places to see within the Alice Springs Cultural Precinct are Alice Springs Cemetery, and Alice Springs Aviation Museum, which exhibits the history of pioneer aviation in Northern Territory. Not far from the Aviation Museum is the wreck of a plane called Kookaburra that crashed in Tanami Desert in 1929. In the Alice Springs Cemetery there are tombs of the famous artist Albert Lamatjira and prospector Harold Lasseter who died here in harsh conditions while looking for gold deposits. There are two lookout points with good views over the town centre: Anzac Hill in the north, and Billy Goat Hill in the south. Near Billy Goat Hill south of the city are the Royal Flying Doctors Service, which flies doctors to the remote outback farms when needed, and the Alice Springs Reptile Centre - one of the best places to get close to Australian reptiles, including snakes. Reptile Centre. Poster by AllPosters. Click on thumbnail to buy. 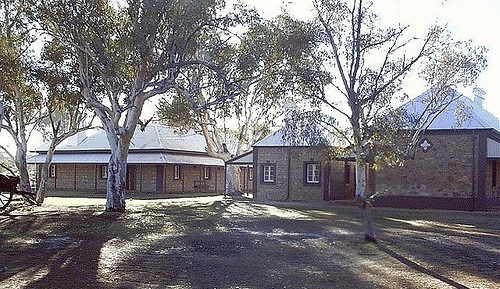 There is another interesting institution in Alice that is unique to the Australian Outback. With distances too long for remote kids to go to school, they are connected to teachers by radios (and nowadays of course computers) from their homes. You can visit a School of the Air in Alice and see teachers talking to kids over thousands of kilometres. There are also guided tours and you can have a look at kids’ drawings in the world’s largest classroom. 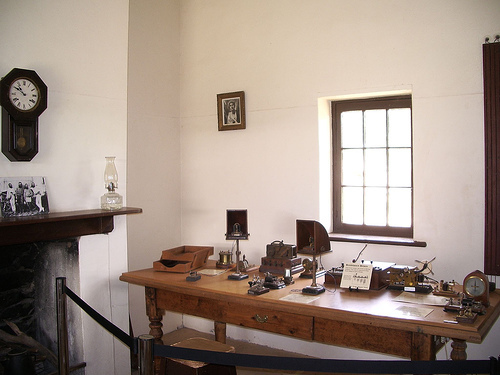 North-east of Alice Springs is the historical Telegraph Station from the 1870s when Alice was nothing but just that – a telegraph station. There is also a blacksmith shop and a homestead; and the starting point of the long bushwalking track Larapinta Trail that goes all the way to West MacDonnell Ranges National Park. 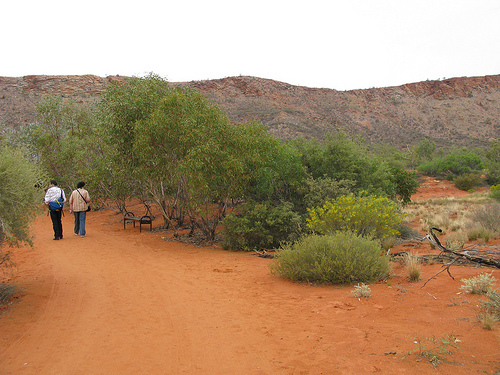 Five kilometres west of town towards West MacDonnells Ranges is the Alice Springs Desert Park – the best attraction in Alice Springs according to many travellers. The region’s plants and animal life is presented in different habitats such as woodland, sandy desert and riverine ecosystems. There are walk-in aviaries to see birds, and a nocturnal house to watch nocturnal animals. There are ranger talks about the animals in the park, and it is only a short walk from the town. Just south of the town across the Todd River is the Olive Pink Botanic Gardens where you can explore more Australian desert plants. There are lots of accommodation available in and around Alice Springs: Alice on Todd Appartments, Alice Tourist Apartments, All Seasons Oasis Hotel, Aurora Hotel, Aurora Red Centre Resort, Best Western Elkira Motel, Bond Springs Outback Retreat, Comfort Inn, Crowne Plaza Hotel, Curtin Springs Station Hotel, Desert Palms Resort, Desert Rose Inn, Diplomat Motel, Erldunda Station Hotel, Haven Backpacker Resort, Heavitree Gap Outback Lodge, Heritage Caravan & Tourist Park Cabins, Motor Inn, Mt Dare Hotel, Plaza Hotel, Stuart Caravan & Tourist Park, The Swagmans Rest Motel, Toddys Hotel, Vatu Sanctuary, White Gum Motel. 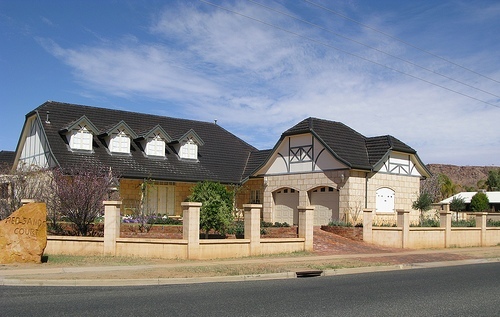 Click here for a longer list of Alice Springs Accommodation. 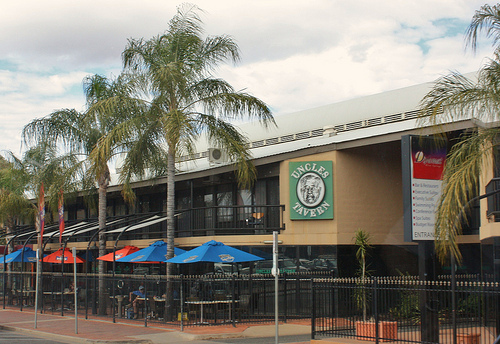 Some good Alice Springs restaurants include Pub Caf, Casa Nostra, Bluegrass Restaurant and Cafe Mediterranean Bar Droppio. There are also some good drinking holes in town, a popular one is Bojangles. There is a surprising amount of festivals and events in Alice Springs, the silliest one being Henley On Todd in late September where bottomless boats are carried along the dry Todd River in a race, but it is fun and a lot of beer is consumed. Other Alice Springs events include Alice Springs Cup in May, Finke Desert Race on the Queens Birthday Weekend in June, AS Beanie Festival in June-July, Camel Cup in mid July, and AS Rodeo in August. Here's an Alice Springs map, where I have tagged the places that I mentioned on this web page. You can click on the tags to see what places they are, and double-click anywhere on the map to zoom it in and see the places closer. Drag the map to move around, and if you want to see the satellite image with Google Earth, click on "Sat" in the top right hand corner.